When operators weigh up their FTTx architecture options, a number of factors will have to be taken into account. These include what assumptions are made about customers’ bandwidth requirements; the topology of the existing legacy network; the level of competition from cable operators; the cost of laying fibre to the node compared with running it the way to the home or building; population density, and the regulatory environment. For the purposes of the The FTTx Mini-Guide, we will focus on three key areas: customers’ bandwidth requirements, cost per FTTx subscriber and regulation. What are the applications and services that will justify investment in either a FTTN or a FTTH/FTTB architecture? Moreover, when do operators need to have their chosen FTTx architectures in place, assuming that the level of customer demand for bandwidth increases beyond the capability of copper-based DSL connections that run between the central office and the end-user? These are key questions for operators as they consider the various fibre access investment options before them. Unfortunately, there are no hard and fast answers. Arguably, the overwhelming majority of consumers do not need – at least for the time being – as much as 100Mbps. That said, operators may be forced to provision more bandwidth than consumers practically require due to the presence of ‘speed competition’ in the market rather than ‘service competition’. But as speed competition represents a sub-optimal business model – high investment for low returns – a key challenge for FTTx operators will be to develop and market services that can bring a significant return on their broadband investment. The good news for operators, provided they can get their marketing strategies right, is that services based on high-speed access networks can significantly boost monthly ARPU. According to Nexans, ‘first generation’ services comprising analogue voice typically produced monthly ARPU in the order of €20-25. With ‘second generation’ services – a combination of Internet access and analogue voice – monthly ARPU rises to €25-30. With next-generation triple- play services – comprising fast Internet, VoD and HDTV – Nexans believes that operators’ monthly ARPU levels can jump to the €30-50 band. Many industry analysts see HDTV as a ‘must-have’ ingredient in operators’ tripleplay offerings. Although the availability of HD channels is much more widespread in the US, South Korea and Japan than other parts of the world, the general consensus is that other developed markets will soon catch up and operators without HDTV will be competitively disadvantaged. How much bandwidth HDTV will require is a moot point. The latest generation of video compression technology –MPEG-4 – is widely accepted as being able to deliver pristine HDTV at between 10-12Mbps. But Harmonic, a US-based provider of IP delivery systems, says it can deliver the same high quality HDTV at 8Mbps – and a lower quality version at 4Mbps – using MPEG-4. A standard definition (SD) TV channel, using MPEG-4, would need 1.5Mbps. 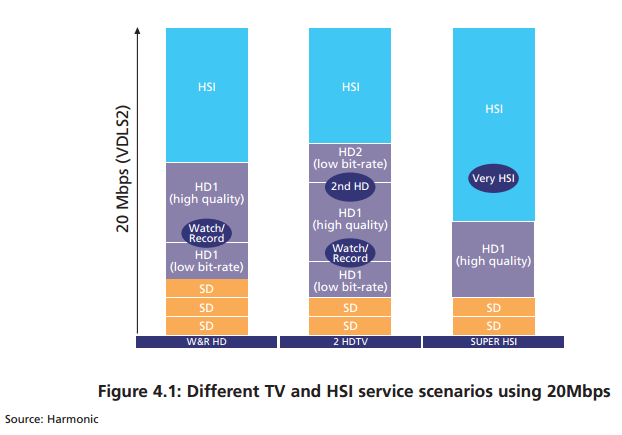 Using these assumptions, Harmonic argues that operators could offer TV and High-Speed Internet (HSI) access services for 20Mbps (Figure 4.1). It is not yet clear, though, how keen content providers and consumers will be on the delivery of MPEG-4 content to larger TV screens. Video compression can noticeably affect picture quality for larger screen sizes (above 40 inches). This could be a problem for operators who base their FTTx choice on MPEG-4 yet compete in markets where the popularity of bigger screen TVs increase. Web 2.0 is an industry term that alludes to using the Internet as a means for sharing user-generated information and creating virtual communities. YouTube, the most popular of the video-sharing sites, reported at the time of its acquisition by Google (October 2006) that users – on a daily basis – were downloading 100 million videos from its site and uploading 60 million. For operators seeking to launch interactive Web 2.0 services of their own, they would need to be able to ramp up bandwidth availability on both the downstream and the upstream as and when demand arose. The volume of P2P traffic, where users send files (audio and video) to each other over the Internet, is increasing rapidly. According to IDATE, P2P now represents 65% of Internet traffic and about 80% of upstream capacity. From an operator’s point of view, P2P is not directly beneficial. It is difficult to generate revenue from it and the transport costs can be high. However, if consumers and businesses perceive P2P applications as valuable – businesses, for example, could use P2P to improve communication between partners and customers – then operators who offer higher bandwidth throughput, particularly on the upstream, should be at a competitive advantage. Although P2P traffic is unlikely to be a direct source of increased revenue, an operator who can facilitate P2P traffic with a higher quality of service than its competitors should have a better chance of increasing revenue indirectly through reducing churn and attracting new customers. The continued rise of P2P traffic raises serious questions about the usefulness of asymmetrical DSL (ADSL) technology in the short- and mid-term. Conversely, the FTTx architectures that can provide greater upstream capacity become more valuable. Videoconferencing and teleworking, coupled with the desire to have increasingly fast remote access to corporate LAN resources, may well be drivers for FTTx investment. However, not all industry sectors will have the same level of demand to transfer large files and not all businesses will have the same level of desire (or need) to initiate video-conferencing sessions. To justify FTTx investment on the basis of serving the business customer, the operator would have to ensure there was a sufficient density of bandwidth-hungry businesses and/or remote workers within the footprint of a FTTB or FTTN architecture. As the level of spending on high-speed services is difficult to predict, so it is unclear how low the cost per FTTx subscriber needs to be before an attractive return on investment can be achieved. The good news for operators is that costs are coming down. Three years ago, the average cost per FTTH subscriber in urban areas in the US was over US$2,000 but it is now down to sub-US$1,000 levels. Verizon reports that at the end of 2005 the cost per FTTP (Fibre-to-the-Premise) was US$1,021; by the end of 2006 that had fallen to US$850. FTTx subscriber costs could even be lower in urban areas where there is a high density of MDUs (multi-dwelling units), such as in Japan and South Korea.The cost reduction can be explained by a combination of vendor consolidation (leading to cheaper components) and ‘smarter’ civil works. Comprising the laying of outdoor cable – either through trenching or by using existing ducts – civil works is the most costly aspect of FTTH rollout. According to IDATE, up to 80% of the total capex required for FTTH rollout on a greenfield site can be soaked up by outside plant construction. There are a number of ways to reduce outside fibre plant construction. 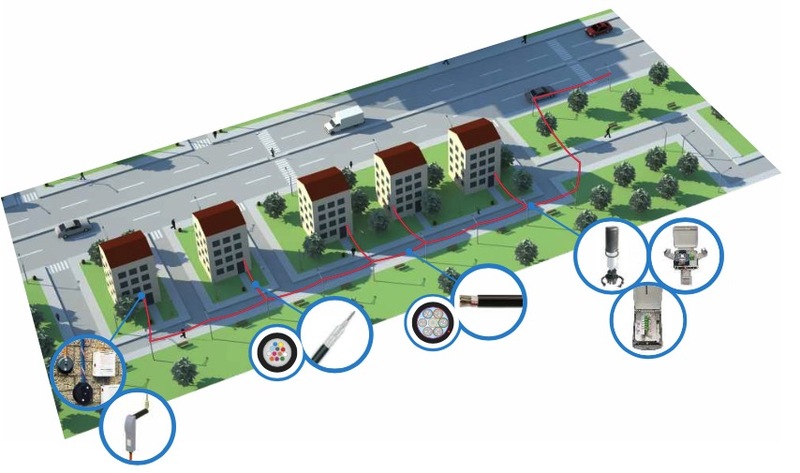 The use of aerial fibre connections – a method used by NTT and Verizon – is one way, while the use of existing underground infrastructure (such as the sewer or underground railway system) is another. The sharing of existing ducts by different operators is another option. The use of existing ducts has been made easier through the technique of ‘blowing’ micro ducts through loose duct tubes, which, in turn, can have strands of fibre blown through them to support 32-user and 64-user PON configurations. According to Nexans, it has improved blowing performance to the extent that it is now possible to install optical fibre at the rate of 4km per hour – or 15 minutes per kilometer – over segments of 2km. Moreover, through its own blown fibre cable assemblies, Nexans can provide fibre installation on an on-demand basis once the micro ducts have been laid. This enables operators to ramp up capex in line with subscriber sign-up revenue. 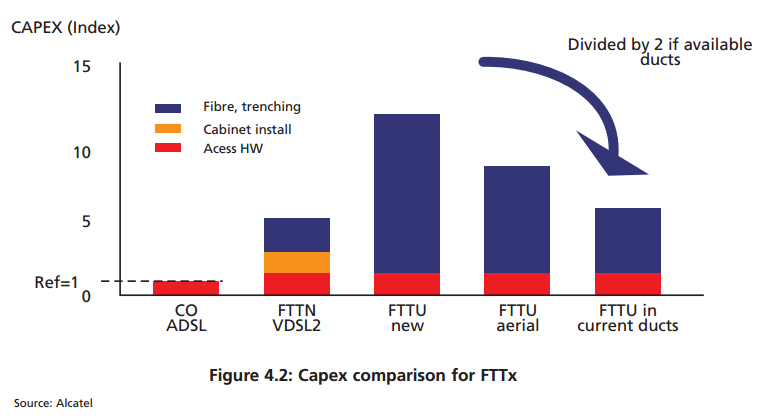 Alcatel-Lucent calculates that FTTH rollout costs can be cut by up to a half if already-laid ducts are available as opposed to building an entirely new outside fibre plant from scratch (Figure 4.2). 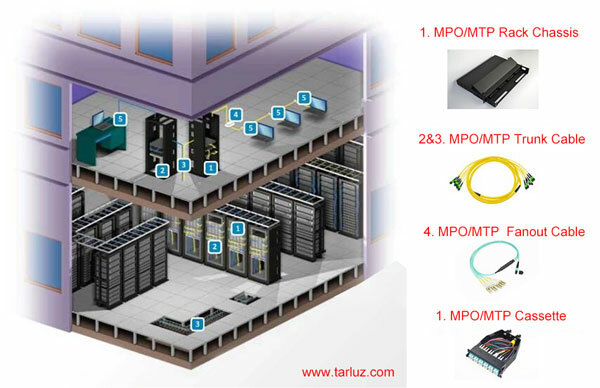 Indoor cabling can also be an expensive item on the FTTH list, particularly for PON operators looking to deliver digital TV and IPTV. Traditionally, PON operators haven’t been able to take advantage of in-home coaxial cable and have needed to send engineers to install CAT5 cable. 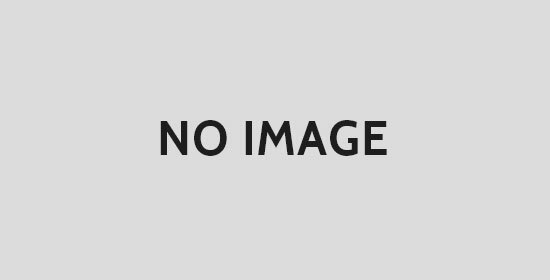 In November 2006, however, Hitachi Telecom (USA) announced the availability of what it claims to be the world’s first GPON ONT that is fully compliant with the MoCA (Multimedia over Coax Alliance) standard. This allows GPON vendors to deliver Digital TV/IPTV over existing co-axial cable. According to Hitachi Telecom, this will cut engineers’ installation time by three to four hours. While government-backed initiatives have helped stimulate FTTx investment in Japan and South Korea, regulatory developments in the US have served to boost the market. incumbents could then invest in FTTx architectures safe in the knowledge that competitors wouldn’t be able to ‘piggy-back’ on their networks, which would make an attractive ROI much harder to achieve. The FCC ruling has had a dramatic effect on the number of FTTH subscribers and the number of ‘Homes/Premises Passed’12 in the US. In mid-2004, there were 78,000 FTTH connections and 189,000 Homes Passed. By the end of 2006, those numbers had increased to over one million and over six million respectively. In Europe, uncertainty over regulation has been a major contributory factor in holding back FTTx investment. In 2006, the European Commission (EC) initiated a public consultation process to review the EU Regulatory Framework13 for electric communications networks and services. At the end of the consultation period – scheduled for the first half of 2007 – the EC is to recommend the relevant retail and wholesale markets that should be subject to so-called ex ante regulation. A market is classified as suitable for ex ante regulatory intervention if there is no prospect of effective competition emerging in the absence of regulation. This would usually be due to the presence of an operator, deemed to have significant market power (SMP) status, having the ability to raise barriers to stop other operators entering that market. The ex ante regulation takes the form of imposing a set of regulatory obligations on the SMP operator to prevent it from using its power to retain a monopoly position. These obligations include unbundling fibre based local loops and to wholesale all retail products to competitors at prices set by the national regulatory authority (NRA). The key regulatory question for operators in Europe is whether or not their highspeed access networks will be ubject to ex ante regulation. They argue that FTTH, as well as FTTN+VDSL, represents a new or ‘emerging’ market and so should be immune from regulatory intervention. By having a so-called ‘regulatory holiday’ – free from ex ante obligations – operators say they will have more incentive to invest in FTTx. When it publishes its final recommendations in 2007, it seems unlikely that the EC will condone regulatory holidays for FTTN+VDSL networks. Viviane Reding, Information Society and Media Commissioner at the EC, has repeatedly stated through the review process that she considers the services running over FTTN+VDSL to be similar to services already in the market using other DSL technologies. Is it less clear whether FTTH will be granted ‘emerging market’ status or not. In the meantime, Deutsche Telekom has said it is holding back on its €3.3 bn plan to roll out FTTN+VDSL2 to 50 cities in Germany until it gets the regulatory certainty it is seeking. But fears about regulation need not necessarily be an FTTx showstopper. KPN, the incumbent operator in the Netherlands, is pushing ahead with its FTTN+VDSL2 plans, despite being forced by the NRA to open up its network to competitors. The threat of competition from Dutch cable operators has outweighed the incumbent’s regulatory concerns. Although EC’s Reding favours infrastructure-based competition to stimulate FTTx innovation and take-up, where that is not possible – perhaps through a lack of sufficient capital or available underground infrastructure – she has proposed as a possible ‘remedy’ to infrastructure monopolies the idea of an enforced ‘functional separation’ between the incumbent’s ‘passive’ and ‘active’ layers. In this context, the ‘passive’ layer includes such things as trenches, ducts and dark fibre; the ‘active’ layer refers to managing the network. The network operator, in this model, would then wholesale capacity to different service providers who would then be responsible for retailing services. As a substitute for infrastructure-based competition, this arrangement is designed to stimulate service competition over one infrastructure and is sometimes referred to as the horizontally-integrated business model. The vertically-integrated model is where the operator is responsible for both the passive and active layers. The FTTH projects in Amsterdam and Vienna have already adopted the horizontally integrated model as a way to stimulate broadband service innovation and take-up in the absence of FTTH investment by the national incumbent.